I Know, You are a WordPress website owner and want to increase your website speed to as fast as it can be. When do you ask any WordPress developer or user about how to speed up WordPress site? They recommend you to install an excellent caching plugin. WordPress have almost 48000 plugins, finding a robust caching plugin still not a big deal. However, Finding a newbie or user-friendly caching plugin for WordPress or best wordpress cache plugin for shared hosting is a difficult task. When I search for WordPress caching plugin on Google, It generates 4,88,000 results. How can I find a user-friendly and powerful caching plugin? This post helps you to find more potent but a user-friendly caching plugin for your WordPress installation. 1 Why We Try to Speed UP WordPress? 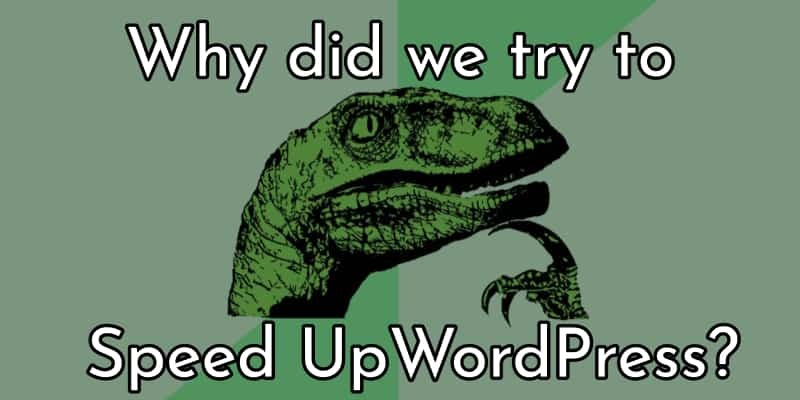 Why We Try to Speed UP WordPress? First of all, I hate the website when it’s not open in 3 to 4 second. I think you should too? We are living in Google dominated the digital world, and Google considers site speed as a ranking factor in organic listening. Please be serious about your website speed and start exploring new ways to improve the speed of your WordPress Installation. For this post, I am using OpenShift free hosting with PHP v5.4.40 and MYSQL v5.5.52 and HTTP/1.1 protocol. I am using WordPress Twenty Sixteen theme with 40MB memory limit. I am using it from 2014 to 2016 to host two blogs, and performance is similar to any shared hosting. Sometimes worst if we compare it with SiteGround. For testing, I am using Post generated by FakerPress with Unsplash It images. Please keep in mind I do not enable any minification setting. I am using the same site and set up for each plugin test. For performance checking, Pingdom Tools and GTmetrix use [Dallas Location]. To run a fair test, I spin each tool five times for each plugin and shows an average number of each matrix. Each URL recorded on excel sheet. Download Caching Plugin Complete Speed Test Result for URL and test proof. Note: Please keep in mind, I am trying to find the most user-friendly and best caching mechanism plugin here. If you have any suggestion or comments, tell me in the comments section. Default WordPress installation with demo posts with seven images on home page with 1 MB page size. KeyCDN makes Cache Enabler, a user-friendly and free caching plugin without tons of option. Cache Enabler creates static HTML page and store in your server disk space. When a user visits on your website, instead of making a call to backend process server serve the static HTML from disk. This makes server lightning fast and improves your WordPress site performance. This plugin comes with a small option set, but it’s compelling enough to recommend by Brian Jackson of woorkup. Setting up Cache Enabler with below video is super lightweight and comfortable. 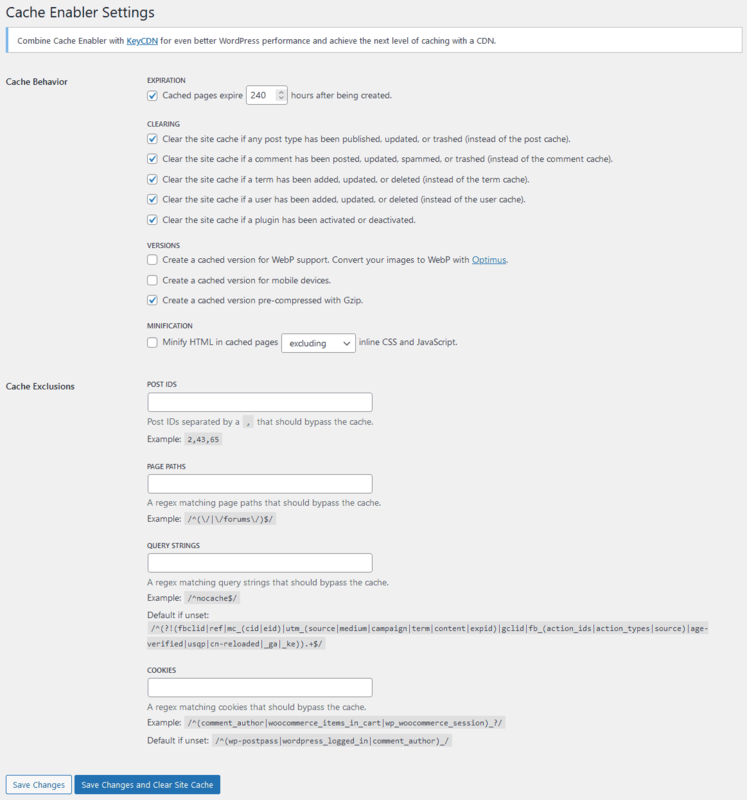 Also check WordPress Cache Enabler Plugin support article from KeyCDN, for better performance setup and troubleshooting. Check this image for my caching setup. I disabled cache minification setting, for a fair fight. One of the best features of Cache enabler is to show actual cache size on your dashboard. It also shows clear cache button in WordPress Admin Toolbar. In Pingdom test, Cache enabler perform 112% faster than default setup. In GTmetrix test, Cache Enabler perform 112% faster than default setup. Taylor Lovett creates Simple Cache after investigating and fed up with the cluttered interface and unnecessarily complex cachings plugins, which is hard to configure. He decides to create the simplest but powerful caching solution. Simple Cache is a free plugin. Extremely simple one-click install. There is an on-off switch. That is it. No need to wade through 50 complicated settings. Want to get advanced with object caching (Memcached or Redis)? An advanced mode is available that automatically set up Batcache and Memcached/Redis for you. Simple: Its activate by default, nothing complex here. Advanced: you find Exception URL and In-Memory Object Caching setting here. For this test I am using default mode, check my settings below. Simple Cache adds Cache clearing button in Admin Toolbar. In Pingdom test, Simple Cache perform 128% faster than default configuration. In GTmetrix test, Simple Cache perform 106% faster than default configuration. WP Fastest Cache (wpfc) is popular cache plugin, with a simple interface. This plugin makes static HTML page, built in CSS and JS Minifier and compressor. I am not using minified or compressing option, for good testing results. I am using free version which is available in WordPress plugin directory. In the free plugin, you get essential features, but it is sufficient for our testing need. You can check premium version here. It is a simple configuration, click WP Fastest Cache plugin option. Check my configuration in below pic. I am not enabling any minifying or combining option but you should too. Otherwise, you do not get the desired speed which you want. In Pingdom test, WP Fastest Cache perform 9% slower than default configuration. In GTmetrix test, WP Fastest Cache perform 103% faster than default configuration. WP Super Cache is a most popular plugin in this list, maintain by Automattic Inc, WordPress parent company. It is active on 1 Million websites. WP Super Cache is a user-friendly plugin, and I use it in easy mode. Only Caching ON (Recommended). WP Super Cache plugin created HTML version of your WordPress installation and served it instead of directly contacting your backend. I remembered, when I first start with WordPress, Google suggest me WP Super Cache and W3 Total Cache. I choose it because it’s easy to install and configure. Check my setting image below. In Pingdom test, WP Super Cache perform 103.5% faster than default configuration. In GTmetrix test, WP Super Cache perform equally with default configuration. WPRocket is the best premium WordPress caching plugin which is creating a positive buzz around the WordPress community. 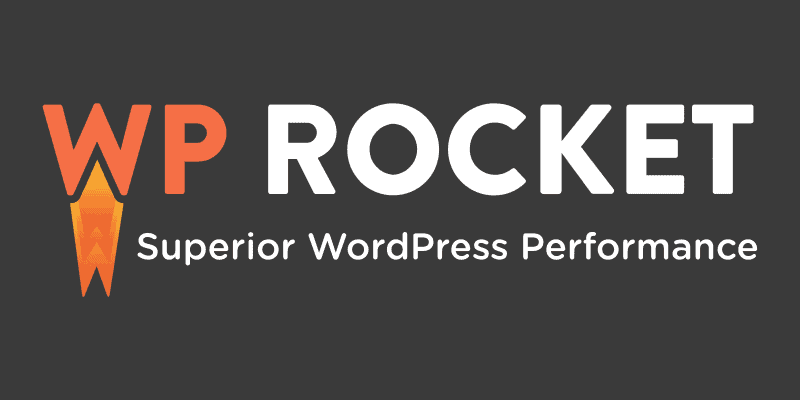 WP Rocket used by some big names in the WordPress world. It has a simple interface for setting, for this test I just activate the plugin, no configuration changes are done by me. What I like about this plugin, after activating this plugin on my blog, I delete Database optimizer plugin, minification plugin, and version remover code. Means, in one plugin price I get four plugins. I am using this plugin for almost 30 months, and it never disappoints me. Caches each of your page and post. Lazyload images, Iframes and videos to improve your page load times. I am not using any setting for this test and check image proof below but you can play with your plugin setting. WPRocket Knowledge Base provides lots of tutorials and settings for speeding up your WordPress Blog. In Pingdom test, WPRocket perform 117.6% faster than default configuration. In GTmetrix test, WPRocket Cache perform 117% faster than default configuration. If you see above results, you explicitly say WP Rocket is a best user-friendly cache plugin present in the WordPress ecosystem, but it’s a premium plugin. If you are a newbie and don’t want to spend money on a premium solution, choose Cache Enabler or Simple Cache. Both are a reliable plugin, easy to use and configure. If you don’t want to use above mention plugins, choose WP Super Cache. I wonder, why WP Fastest Cache give me the bad results. If you want to buy a premium solution, buy WP Rocket. WP Rocket team surely know how to optimize plugin and speed of customer website. Please mention a plugin you are currently using to improve the speed of your WordPress blogs or website in a comment, also tell me what you think about my 5 best User-friendly WordPress Caching Plugins finding. Hello mate! For me, tweaking page load speed is always a serious matter. I have dedicated much time in evaluating plugins that claim to optimize WordPress page load speed. I know that W3 Total Cache has a very good reputation in the industry. Recently I came across two page load optimization resources, Hummingbird and Breeze Cache Plugin that I would personally recommend WordPress Community to give a try. I have stackcache preinstalled in my managed WP. Can I install another cache plugin again? I never advise installing any WordPress plugin for speed things up if your host handles it at the server level. At BlogGaani, we are using Nginx web server and use Nginx Helper by rtMedia. But if you still facing performance and speed issue then contact your hosting provider. Have you compared these to LSCache from LiteSpeed? People seem to be getting really incredible results from it. I know about it but for better performance its required to use litespeed server. I know, but for most users, Nginx working fine especially when it’s combined with webinoly or easyengine like optimizing scripts. Hi there! Shameless promotion for my plugin, WP Roids. It’s fast AF!